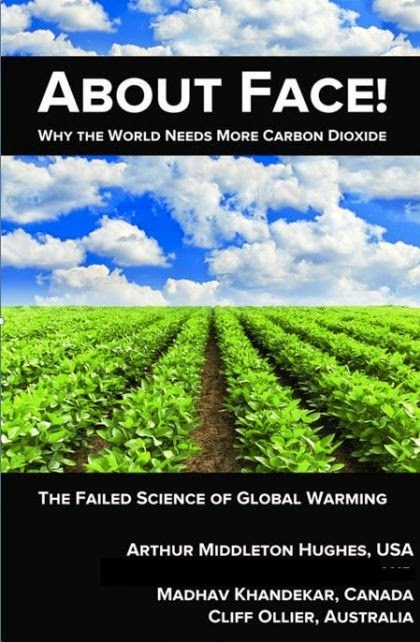 About Face: Why the world needs more CO2: The failed science of global warming! A new book by Arthur Middleton Hughes, Madhav Khandekar and Cliff Ollier. Arthur invited Cliff and Madhav to join him in writing various sections of the book. Unfortunately lead author Arthur Middleton Hughes, an economist in Florida ( former Deputy to Commerce/Treasury Secretary Bill Simon during President Nixon ) passed away just about ten days ago! Like many, Arthur started off as a believer in the AGW Hoax but then realised the scam. Like everyone else, I read about global warming: that increases in carbon dioxide (CO2) in our atmosphere are warming the Earth and will eventually involve us in an unstoppable "runaway greenhouse effect" that will destroy the planet and ourselves. At first, I thought that the idea of global warming was true. I experimented with solutions to the CO2 problem. I spent more than a year thinking through the idea of massive planning some trees in the deserts of Australia watered by desalination plants on the shore. I proved, to my satisfaction at least, that such trees could convert enough CO2 in a year to represent 40% of the needed CO2 reduction, while making a big profit for the plantation and desalination plan investors. But in getting to the bottom of the science of CO2, I realised that CO2 really is essential to all life on this earth. Photosynthesis is what keeps us alive. Sunlight plus water plus CO2 is the basic process that creates all plants - the basic food that animals and people have to eat – without which our life would be impossible. So how can this same CO2 at the same time be destroying our way of life? I began to read extensively about climate science in books by famous scientists like Vincent Gray, Cliff Ollier, Madhav Khandekar, S Fred Singer, Craig Idso, Robert Carter and many others. That is when I saw that there was a floor in the "CO2 is bad for us" argument. The basic flaw is that CO2 is such a tiny fraction of our atmosphere– 0.04%– That it could not possibly be warming the Earth by any significant amount. CO2 is good. We need more of it, not less. 100,000 molecules of air since 1957. Not much of an increase. every year. 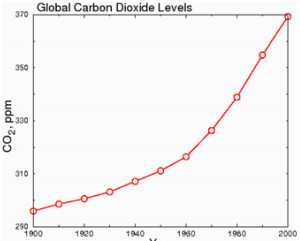 Some people think that CO2 is rising dramatically. of zero. 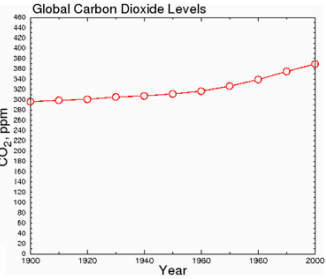 This misleads the reader into thinking that CO2 levels have undergone a huge increase. CO2 increase from 1800 to 2001 was 89.5 ppmv (parts per million by volume). The atmospheric carbon dioxide level has now (through July, 2014) increased since 2001 by 27.41 ppmv (an amount equal to 30.6% of the increase that took place from 1800 to 2001) (1800, 281.6 ppmv; 2001, 371.13 ppmv; July, 2014, 398.54 ppmv). The average global temperature trend since before 2001 is flat (average of the 5 reporting agencies). That is the observation. No amount of spin can rationalize that the temperature increase to 2001 was caused by a CO2 increase of 89.5 ppmv but that 27.41 ppmv additional CO2 increase had no effect on the average global temperature trend after 2001. Search AGWunveiled to discover the equation with two natural drivers that explains measured average global temperatures since before 1900 with 95% correlation (R^2 greater than 0.9), credible hind-casting back to 1610 (Little Ice Age) and average global temperature trend prediction to 2037. CO2 is not one of the drivers. As the next cooling cycle gets underway, we will desperately wish CO2 was a "driver". I simply don't accept that the rise we have seen in CO2 concentrations since measurements began can be conclusively attributed human activity. Before 1957 we only have proxy data and proxy data simply doesn't cut it IMHO. We just don't know what the real CO2 concentration was 100, 200, 1000, or 10000 years ago. Correlation is not causation so I am amazed that even those on the sceptical side of the argument accept so readily that that we do know. Certainly Murry Selby's research has brought this hypothesis into question. The point is, Murray, there is NO correlation between CO2 and temperature.